Just about every type of wet sludge is currently being successfully dewatered in HUBER QPRESS rotary screw presses, including aerobic, anaerobic, primary, chemical, or a combination of these produced by both industrial trade waste plants and municipal sewage treatment plants. In 2016, Hydroflux Industrial installed a HyDAF Dissolved Air Flotation system at an abattoir in SE Queensland. The HyDAF system was designed to remove fats from the abattoir’s wastewater, which it is doing successfully without any chemical addition. With several ML of wastewater being treated per day, the volume of fatty sludge removed by the DAF is significant, so a means of reducing the free water content was investigated. Hydroflux Utilities conducted test work using several new HydraBond flocculants specially formulated to work with high fat laden waste streams. These tests were successful with only a low dose of polymer and no other chemical conditioning being required. It was concluded that utilising one of these specific flocculants, the HUBER QPRESS would be able to provide a high volume reduction in the sludge and subsequently the system was installed and successfully commissioned in early 2018. The final results were outstanding, with the HUBER QPRESS rotary screw press generating a spadable cake with dry solids concentration well in excess of 25%, excellent solids capture and a clear filtrate. This installation demonstrates the HUBER QPRESS’s unique ability to even dewater sludge with a high fat content whilst producing a dry cake and is one of many reference sites where Hydroflux have successfully applied the HUBER QPRESS to industrial applications. The HUBER QPRESS uses 90% less energy compared to a traditional centrifuge, which results in exceptionally low power and maintenance costs. It also uses a fraction of the washwater and has a higher capture rate than traditional belt presses. Click here for more information on the HUBER QPRESS. 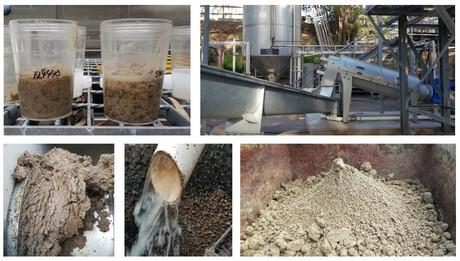 Photos from left to right: Jar testing; installed screw press and conveyor; dewatered sludge discharging from the screw press; screw press filtrate; spadable cake.